Let’s face it, Vermont is the Best of the East, but it can go from first to worst in a thunderclap. Here’s a typical Vermont ski trip: Monday — 20°, the air is still as you rip through fresh powder and sweat in the sunshine. Tuesday — 40°, you hang out at the lodge and watch a steady, pouring rain. Wednesday — 10°, the wind is howling as you skate down the mountain, and your car won’t start at 4:30 while the sun sets and the temperature plummets another ten. Usually, of course, conditions are “typical Vermont,” which is to say, the best in the East. Some powder, lots of packed powder, patches of ice, too many people. The mountains are great — the terrain, the scenery, the atmosphere; and the conditions tend to be a bit better than everywhere else in the east, with the possible exception of Tremblant and a few other Canadian resorts. In addition to conditions, the ski areas are no slouches either. Ascutney Outdoors Brownsville • 170′ vertical. Specs: Rope tow operated by the community, the ski hill is about 800′ long. No snowmaking at this time. The SKInny: Ascutney Resort was an underrated, potentially outstanding area, constantly plagued by money problems. It closed prior to the 2011 season amid fingerpointing, lift auctions, etc. Enter the townspeople, who said we want this, and took on the area as a 501c3something non-profit. Lo and behold they had a fully operational rope tow in place for the 2015-16 season, which by all accounts sucked. (The season, not the rope tow. The tow is great, runs 690 feet per minute so hang on baby) Really is good to see this, and by the time you stop in they be charging a modest fee for lift tickets. If they are, pay it, and have fun. This kind of operation is essential to the future of our sport and deserves as much support as we can give it. Bellows Falls Village Area, Bellows Falls • Approximately 5 skiable acres on 350′ vertical. Specs: Summit elevation: 1100′; base elevation: 650′. 1 Lift: 950′ rope tow. Ski building donated by Ben & Jerry’s; eat up. The SKInny: Located at the town’s Rockingham Recreation area. Vermont — no, the entire country — needs more of these “town tow” operations. It’s real, it’s local. With an easy hill and tickets that are virtually free, it’s a lot less stressful than taking your seven year old to Killington. Bear Creek Club public operations discontinued; de-listed. This is the ski area you pass on Rt. 100 in Plymouth. Back in the day was called Round Top. Bolton Valley Resort Bolton Valley; (802) 802-434-3444 • 168 skiable acres on 1,625′ vertical. Specs: Summit Elevation: 3,150′; Base Elevation: 1,525′. 6 Lifts: 1 Poma Lift, 4 Double Chairs, 1 Quad Chair. Uphill Capacity: 6,000/hr. Terrain Mix: 27% 48% 22% 3%. Longest Run: 10,560′. Annual Snowfall: 300 inches. Snowmaking: 60 %. Season: Thanksgiving – mid April. Night Skiing offered. The SKInny: Old line Vermont ski area. Has had some glitches in the operation; changes in ownership/management etc. through the years, but it’s on fairly good footing these days. Fortunately for you, Bolton is located between Stowe and Sugarbush…and most people opt for those, which means you really don’t have the crowds of most Vermont resorts. It’s sort of a poor man’s Stowe, which is a fine thing to be. Good skiing is never a problem at Bolton. There are more or less two types of skiers who go to BV. First and foremost, families from Headed to Bolton? Beware your transmission. Leaving? Check your brakes. Bromley Mountain Manchester Center; (802) 824-5522 • 300 skiable acres on 1,334′ vertical. Specs: Summit elevation: 3,284 feet; Base elevation: 1,950 feet. 10 Lifts: 1 high-speed quad, 1 quad, 4 doubles, 4 surface lifts. Uphill capacity: 9,045/hr. Season: mid November – mid April. Snowmaking: 84 percent. The SKInny: “Big Bromley” now calls itself the “Sun Mountain.” Another old line ski area; traces back to a J-bar roped up in 1941, which was “Little Bromley.” Fred Pabst built this place, a few of the trails still bear his name. Family oriented. Bromley does a great job of being all things to all people; a big open area for novices, some twists for intermediates, and a pseudo-separate “face” with 919′ vertical and its own chair (Stargazer) for experts. Emphasis surely is on novice/intermediate. Hotshots will prefer Magic or Stratton. Less crowded than most, and you can find your friends and family easily at the base. Not a huge ski area for “wanderers” but there are enough trails and surprising turns and connectors seem to pop up here and there, so wanderers do tend to enjoy Bromley. Novices and Intermediates will do quite well at Bromley, provided they stay on the main “face.” The steeps on the Stargazer side are short, but difficulty on one or two rivals just about anything on the east coast. When groomed, they’re skiable by high-end intermediates. East Meadow chair is agonizingly slow, but is an excellent venue for learners/beginners. Signature Trail: Blue Ribbon, on the Stargazer face. Burke East Burke • 180 skiable acres on 2,000′ vertical. Specs: Summit Elevation: 3,267′; Base Elevation: 1,267′. 4 Lifts: 1 J-bar, 1 High-Speed Surface Lift, 1 Double Chair, 1 Quad Chair. Uphill Capacity: 3,500/hr. Trail Mix: 25%, 45%, 30%. Longest Run: 13,500′. Season: mid November – mid April. Annual Snowfall: 250 inches. Snowmaking: 75 %. The SKInny: Like its better known neighbor, Jay, Burke is big and cold; people rave about awesome conditions or holler about slopes better suited for hockey. Not as crowded as the Sugarbushes, Strattons, and Stowes, and not as polished. Nicknamed “The Big Bear.” Don’t underestimate this mountain. New England ski journalist Steve Rheaume says it best: “Lots of fun rolling trails that have some quirks with plenty of challenge in the woods. Ideal for families as long as everyone can handle a solid blue.” Otherwise, there is plenty of beginner terrain — separate, on sort of a “lower mountain” — and it’s serviced by a spanking new HSQ. Burke has gone through what we’ll call a “weird” recent history, renamed “Q-Burke” and after a time in the eye of a swirling storm of EB-5 misuse accusations, it’s running in some sort of Fed-ordered receivership. As long as the mountain keeps running, we’ll keep going. It’s really a terrific ski area. Chapman Hill, Williston • 10 skiable acres on 100′ vertical. Specs: 1 rope tow, base hut. Private, member-run club. Guest policy unknown. This is a small tow outside of Burlington, seems to have been non-operational for a year or two. Rumor has it that some folks are trying to keep it together, we’ll wait and see. Cochran Ski Area Richmond; (802) 434-2479 • 30 skiable acres on 500′ vertical. Specs: Summit Elevation: 1,000′; Base Elevation: 500′. 4 Surface Lifts. Uphill Capacity: 2,000/hr. Trail Mix: 22-56-22. Longest Run: 2,600′. Season: mid December – mid March. Annual Snowfall: 88 inches. The SKInny: Built as a family rope tow in 1961, it put the “Four skiing Cochrans” in the Olympic Games. After Barbara Ann Cochran captured the Olympic gold medal in slalom in 1972, the small facility grew into a local winter recreation area with four lifts and eight slopes attracting a loyal contingent of children and families from around Vermont. With the passing of Mickey Cochran in 1998, Cochran Ski Area was approved for non-profit status by the IRS. It is really a ski training area for children, a place for local kids, etc. But if you ever have the opportunity, pay your few dollars and ski some history. This is one of the few “local tows” still operating, and it has more heart than all the big boys put together. Signature Trail: None needed. Just knowing you’ve skied at Cochran’s is enough. You’ve either skied Cochran’s, or you haven’t. Once you do, you’ll gain some insight into the heart and heritage of our sport. Also, if they’re offering their combination lift ticket and dinner, you’ll want to get that. Unless you’re Scrooge you’ll buy the dinner, because dammit, Tiny Tim is out there on the hill. Haystack • West Dover Old-line ski area that was purchased and then sold by American Skiing Company, back when that doomed entity owned nearby Mount snow. Haystack as a public ski area closed in 2005. Now operated as a private area, see Hermitage Club, below. Hard’ack Hill • St. Albans 10 skiable acres on approx. 100′ vertical. Specs: 1 surface lift, snowmaking, grooming, warming hut. Open for ski school & racing Thursdays; open to the public on Friday, Saturday, Sunday and school vacation days. Night skiing until 8 pm on Fridays and Saturdays. Cross country skiing and skating facilities. The Skinny: This is one of those typical New England town tows that fell into disuse and eventually closed when it was assumed that it was too expensive to keep it going. Kudos to the people of St. Albans for realizing that the cost of a misspent youth is a lot more expensive than running a small ski hill…the facilities have been rebuilt, and this place is simply a fantastic addition to the community. Now you know it isn’t something you’re going to seek out as a destination ski area, but if you happen to be cruising along I-89 and you’ve got a few minutes to spare, make sure you pull in to 179 Congress Street and make some turns. If you don’t have time for that, there is a donation box at the base between the mountain ops building and the warming hut. We’ll say it again: It is our duty as skiers to support operations like Hard’ack Hill. And then the bills came due, and now it’s in a state of flux. Lawsuits, bankruptcy…definitely not the way it all started. If you ever ski there, drop us a line and let us know how it is these days. Jay Peak Jay; (802) 988-2611 • 600 skiable acres (385 plus 200 off-piste) on 2153′ vertical. Specs: Summit elevation: 3,968 feet; Base elevation: 1,815 feet. 8 Lifts: 1 60-passenger aerial tramway, 1 high-speed quad, 2 quads, 1 triple, 1 double, 1 T-bar, 1 Magic Carpet. Uphill capacity: 10,615 per hour. Season: mid November – late April. Snowmaking: 80 percent. The Skinny: Jay is big, cold, fantastic when conditions are right, horrifying when they aren’t. It looks deceptively easy when you see those magnificent aerial photos, but it has some steeps that rank with the best of them. Skiing at Jay feels like three ski areas, and it’s still growing. Lots of history here; some of the most notable personalities in the history of skiing have been involved with Jay. A little of everything; short lines are easy to find if you look around. Wanderers will enjoy Jay. Although targeted to all abilities, experts will feel most at home at Jay, while the novice will be limited to certain areas. The novice skiing is ample and certainly good, but doesn’t offer the whole “Jay” experience. Tree skiers flock to Jay when the powder hits. Like neighbor Burke, Jay got caught up in some kind of EB-5 imbroglio in 2016 and the exact future (and for that matter, the present) is unclear but the resort is still running full speed ahead. Signature Trail: Vermonter, although a case could be made for St. George’s Prayer to Northway. St. George’s and Northway date from the early days of expansion; one of the few routes that hasn’t been renamed over the years and it’s pretty much how Walter Foeger and crew laid it out. You’re skiing on history on St. George’s Prayer. Specs: Summit Elevation: 4,241′; Base Elevation: 1,165′. 32 Lifts: 2 gondolas, 6 high-speed quads, 6 quads, 6 triples, 4 doubles, 8 surface lifts. uphill Capacity: 52,973/hr. Season: November – late May, although the Big K is known to open in late October and sometimes has something resembling skiing on June 1. Trail Mix: 30-39-31. Longest Run: 53,850′. Annual Snowfall: 250 inches. Snowmaking: 70 percent. 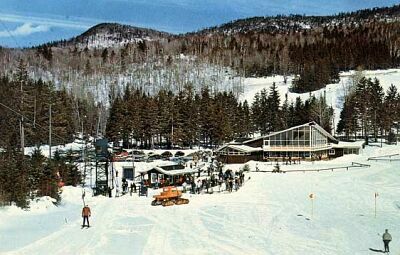 The SKInny: With the addition of the old gondy in the late 1960s, Big K stretched from Killington Peak way down to Route 4, and it is 3150 vertical feet. But most people won’t ski that; most skiing at Killington is based on the 2,000 vertical at the main face of Killington Peak, including the Glades Area (now called Rhyme and Reason or something) and the smaller but impressive Snowdon and Ram’s Head. It just gets more developed and more commercial and more crowded with every passing year. [Please click here for a personal perspective] With traverses and connectors running hither and yon, it’s a wanderers paradise; your children can get lost. Easily. Was operated for quite a while by American Skiing Company, until mounting debt forced that company to sell to Powdr Corp (Park City UT). New owners made a few enemies with old-line K-Mart skiers by announcing “normal” opening and closing dates, then turned around and surprised everyone by opening “early” when some snow fell. Sounds sensible. It’s a big, crowded ski area, and provides something for everyone. Experts and hotshots, wanderers, novices, tree skiers…all will find ways to stay occupied at the Beast of the East. If you’re a really, really good skier, and you want terrain both inbounds and out that will challenge your intensity, Killington is a place you want to go often. On the other hand, if you’re a really bad skier, and you like to be entangled among lots of other bad skiers, Killington delivers just as well. The Aspen of the East? Nonsense. Killington doesn’t need that title. It’s Killington. Best Skiing: Novices: Snowshed and, with more experience, Ram’s Head. Intermediates: The Glades (or whatever those trails are called now) also Ram’s Head, Killington Peak following the ridge line but bypassing Cascade and Superstar, etc. Experts: Killington Peak/Canyon and Outer Limits chair. Extreme Experts with Professional Guide: the backside, with a long run out to the Catamount XC Trail. But you didn’t read that here. If you don’t know it, don’t do it, or I promise your name will appear on our news page and you will get a bill for rescue expenses from the State Police. Signature Trail: Cascade. Another is Superstar. Wow, am I tired…was banging down Superstar all day. The modern day biggie is Outer Limits, which is the longest, steepest mogul trail in the East — and there aren’t too many in the West that push farther. Much tougher than Superstar. Specs: Summit Elevation: 1126′, Base Elevation: 822′. 1 Lift: T-Bar. Season: Not specified but generally December – February. Has been open in March. No snowmaking. Night skiing: Thursdays and Fridays. The SKInny: This is one of the few New England “town tows” that is still operational. Open from 1955-1995, a non-profit group of volunteers raised funding and worked tirelessly to reopen Living Memorial in 1999. (There is NO funding from the Town of Brattleboro). Although the municipally-owned “slope” is often crowded with sleds, tubes, etc. the lift is seldom stressed by a high volume of users, and the upper portion of the slope is usually empty. It’s terrific skiing, and the lift tickets are so cheap I urge you to add a little donation as well. I strongly recommend this place for an all-out family day; an indoor ice-skating rink across the street just adds to the versatility of this spot. Hard to find; it’s across the covered bridge on Guilford St. in Brattleboro. The Skiing: Relaxing, fun. Ideal beginner location. Specs: Summit Elevation: 1601′, Base Elevation: 1168′. 3 Lifts: 1 T-Bar; 2 rope tows. Season: Not specified but generally December – March. No snowmaking. Night skiing is offered. The SKInny: A great spot to stop and make a few unhurried runs. It’s arguably the best “local tow” operations in New England, with a number of legitimate trails rather than the typical open field…not to mention a base restaurant! The Skiing: Quasi-beginner/intermediate skiing. A great hill for a family afternoon, place to take the new girlfriend, etc. Specs: Summit Elevation: 3,637′; Base Elevation: 1,600′. 5 Lifts: 1 single chair, 3 double chairs, 1 surface. Uphill Capacity: 3,574/hr. Season: mid December – mid April. Trail Mix: 30-30-40. Longest Run: 15,840′. Annual Snowfall: 250 inches. Snowmaking: 15%. The SKInny: Mad River Glen, Ski it if You Can. That’s become a cliche, but it’s still true. Be prepared for a few rocks…and if you head for Mad River, you probably prefer it that way. Want to wander into the woods? Jump 6′ down a rock chute? Arrive early, ski late. Wanderers will enjoy it, hotshots will be humbled. This truly is hallowed ground…ski with reverence, know the history, appreciate the fact that you have stepped back in time and that a large percentage of the ownership group is fighting to keep it that way. Novice and intermediate skiers tend to avoid MRG, but I feel that’s a mistake. There are plenty of fabulous novice and intermediate runs on the right side of the mountain (skier’s left), even if you aren’t ready for the single chair…and there tend to be little or no lines on those lifts! Even the venerable single chair offers a nice groomed run from the top — not for novices, but certainly even low level intermediates can find their way down. For novices, Birdland is hard to beat. This ski area offers a lot more terrain than its pundits would lead you to believe. Yes, experts will make the most of this mountain, but there is definitely enough terrain for the rest of the pack. On the other hand, there is tree terrain that will challenge even the best skiers in the world. Novice to expert, put Mad River Glen atop your bucket list. Leave the golf clubs and the Gucci bag at home. Also leave the snowboard at home — sorry to say boards aren’t permitted, but at the same time it does make for a more cohesive on-hill experience for skiers. If you’re a skier’s skier, and you don’t care about the waffles and shopping at the base village, Mad River Glen is where you want to be. PS: The old man carrying the Olin Mark IVs will school you in the trees. Magic Mountain Londonderry; (802) 824-5645 • 135 skiable acres on 1,600′ vertical. Specs: Summit elevation: 2,850 feet. 4 Lifts: 1 triple, 1 double, 2 surface lifts. Uphill capacity: unknown. Trail Mix: 25-25-50. Longest Run: 8,575′. Season: mid December – mid April. Annual Snowfall: 180 inches. Snowmaking: 87 percent (?!). The SKInny: Folks, after a few seasons of operation by a management team that seems incredibly comptetent by Magic standards, we’ve had to revise our description. Magic had a lot of “troubled” years. Things aren’t perfect yet, but they are serving up a healthy dose of traditional New England skiing, and they seem to have dispensed with the seat-of-the-pants approach that highlighted the first few years of the new millenium. It’s clean, it’s painted, they’re making repairs as they can, updating equipment when it makes sense. And so here’s our take: Normal people may now return to Magic! It’s always been a terrific mountain with plenty of variety. From long twisting routes for families of novices to psycho steep glades, Magic has something for everyone. It’s sort of like Mad River Glen, sort of like Stowe from 40 years ago. Seldom if ever crowded, it’s just a terrific throwback ski area that delivers a nice mix of trails. So much has improved in recent years, starting with the professionalism in the front office. The only thing that hasn’t changed is Magic’s lower base elevation; it will often be warmer down in Londonderry than at neighboring Stratton and Bromley, which means the other two corners of the golden triangle usually have better conditions. But when conditions are on and the trail count is up, Magic is easily the best deal in town. Specs: Summit Elevation: 2,650′; Base Elevation: 1,600′. 3 Lifts: 2 doubles, 1 triple. uphill Capacity: 3,400/hr. Season: December – Early April. Trail Mix: 30-30-40. Longest Run: 7,920′. Annual Snowfall: 130 inches. Snowmaking: 35 percent. Above: Middlebury College Snow Bowl circa 1960. The SKInny: With trails first cut on Worth Mt. in 1934, this is another of the old line New England ski areas. Glades, open bowls, narrow trails, there’s much more here than you might expect. Top adult ticket price is reasonable. Owned by moderately snobby Middlebury College, it’s a great ski area, seldom crowded and has something for skiers of every ability. Specs: Summit elevation: 3,466 feet; Base elevation: 1,900 feet. 23 Lifts: 4 quads, 10 triples, 4 doubles, 2 surface lifts, 3 magic carpets. Uphill capacity: 36,252/hr. Trail Mix: 30-40-30. Longest Run: 13,200′. Season: mid November – mid April. Annual Snowfall: 163 inches. Snowmaking: 75 percent. The Skiing: Novices abound on Deer Run (now Long John, name changes piss me off) and many can handle the Sunbrook area. Intermediates can own Sunbrook, switching off with a plethora of trails on the main face. Snowboarders and kids can escape to the newly remodeled Carinthia, while experts strut their stuff on the north side. Signature Trails: Novices love Long John/Deer Run, a classic green turnpike with little or no cross traffic. Snowdance is the everyman’s trail that put Snow on the map, and for experts, well it’s got to be Ripcord: Nasty, nasty slope. Click here for our new, in-depth trail-by-trail and chair-by-chair “insider’s guide” to Mount Snow” completely illustrated web page. It’s a must-click if you’re planning to visit Mount Snow. Discount Lift Tickets: If you can plan in advance, and know for certain what day or days you are skiing, there is a very effective way to get discount tix for Mount Snow via Liftopia. Just use that link, and a tiny percentage gets kicked back to this website, at no cost to you. It helps to keep SkiBum.net on the line. Specs: Summit elevation: 3,344 feet; Base elevation: 1,194 feet. 18 Lifts: 9 quads, 3 triples, 6 surface lifts. Uphill capacity: 31,250/hr. Trail Mix: 31-43-26. Longest Run: 23,760′. Season: early November – mid April. Annual Snowfall: 200 inches. Snowmaking: 95 percent. The SKInny: Okemo is your prototypical modern ski resort. Gleaming slopeside condos, ski-in/ski-out palatial homes, and a little train to take you around. Trails go over and under roads, wind in and out of condos, and the whole thing is a bit nauseating if you prefer skiing amidst natural environs. If Disney made a ski area, Okemo would be it. Everything is groomed. And groomed, and groomed. That said, it is a great, big ski area; wanderers will positively love it. Hotshots will be a little underwhelmed. Novices and families will find plenty of room to ski together, and will wait on lines here and there. As I write this, Jackson Gore is nearing completion. It’s Downtown Disney with a ski area attached to it. Here’s a suggestion: If you start at the main base lodge, most people opt for the chairs straight ahead. Do not. Instead hump up the 200′ hill to the D chair, the Sachem Quad. The Sachem Quad is as slow as an old dog, but will put you in the heart of things much more quickly than the other chairs. Pico, Killington (formerly Sherburne) • 208 skiable acres on 1,967′ vertical Operational Status: Part Time. Specs: Summit elevation: 3,967 feet; Base elevation: 2,000 feet. 6 Lifts: 1 quads, 3 triples, 2 doubles. Uphill capacity: 10,650/hr. Trail Mix: 31-48-31. Longest Run: 8,575′. Season: November – Late March. Annual Snowfall: 250 inches. Snowmaking: 80 percent. The SKInny: Formerly an independent operation known as Pico Peak; part of the Killington megaski operation since 1996. Pico is like a good bottle of wine that nobody’s ever heard of: Someone asks if you like Killington, you reply that you prefer Pico, they look perplexed and say that they’ve never tried it. This makes you feel good, because you don’t need to impress them and you sure don’t want demand to go up. Neat thing about Pico is the summit has a similar feel to the old Ram’s Head summit next door on Killington. Problem is it suffers from the same nasty winds that caused Ram’s Head to be lowered below the “head.” The summit quad on Pico has not, and as a result is closed on days with extreme wind. Note that beginning with the 2007-08 season, Pico was reduced to part-time operations; call the mountain on a weekday to make sure it’s running. This is really a fun place to ski. Specs: Summit elevation: 3,640 feet; Base elevation: 1,030 feet. 8 Lifts: 6 doubles, 2 surface lifts. Uphill capacity: 7,200/hr. Trail Mix: 22-53-19. Longest Run: 18,480′. Season: late November – early April. Annual Snowfall: 284 inches. Snowmaking: 62 percent. The SKInny: This is a monster ski area, ideal for families, novices, intermediates, experts, wanderers…anybody on sticks. One of the best anywhere for the family vacation market. Lines can be bothersome, but you sure have plenty of elbow room on the mountains. Emphasis is on novice and intermediate skiing; what the expert finds, he will find challenging. Great for wanderers. Hotshots should head for Stowe. Despite its size and positive “family” reputation, Smuggler’s Notch is still somehow underrated! Easily one of the best ski areas in the east. Signature Trail: Upper Liftline on Madonna. Sonnenberg at Twin Farms, Barnard • Approximately 20 skiable acres on 450′ vertical. Specs: Summit elevation: 1900′; Base elevation: 1450′. 2 poma lifts. Ticket Sales Limited. The SKInny: Formerly Ski Sonnenberg, this is a private “guest house” resort type operation that offers skiing as a draw. It is really an elegant little operation; designed more for the refined gourmet on vacation who happens to ski a little after lunch. So why ski it? Sonnenberg is a slice of Vermont ski history (the 1960s boom), and the only time you wait on line is when Mrs. Rockefellervanderbilt is fussing with her outfit. Specs: Summit elevation: 4,395 feet; Base elevation: 1,280 feet. 12 Lifts: 1 gondola, 1 quad, 1 triple, 6 doubles, 3 surface lifts. Uphill capacity: 12,326/hr. Trail Mix: 16-59-25. Longest Run: 19,700′. Season: mid November – mid April. Annual Snowfall: 260 inches. Snowmaking: 73 percent. The SKInny: Stowe is the original ski resort, and still is the ultimate New England ski town. It is the ultimate New England ski destination, which combined with some clunky lifts, results in long lines at times. Wanderers will be better off at Smuggler’s, while the hotshot can try his hand at the “original” four: National, Goat, Starr, and the Nose Dive. It’s big, it’s beautiful, it’s expensive. Signature Trails: The Nose Dive; see photo immediately above. It’s been tamed over the years, but it’s still the Nose Dive. This trail was the setting for some of the world’s most thrilling ski racing of the 1930s and 40s. The other classics, if you’ve got the stuff: National, Goat, Liftline, and Starr (the fabled front four). Toll Road is another classic trail. So is Perry Merrill under the chin. This is Stowe, take your pick of signature trails. Plenty to choose from. Strafford Ski Tow, aka Strafford Lions Ski Tow see Harrington Hill, above. Specs: Summit elevation: 3875 feet; Base elevation: 1872 feet. 16 Lifts: 1 gondola, 4 sixers, 4 quads, 1 triple, 1 double, 2 surface lifts, 3 magic carpets. Uphill capacity: 21,020/hr. Trail Mix: 42-31-27. Longest Run: 15,840′. Season: mid November – April, sometimes May. Annual Snowfall: 180 inches. Snowmaking: 90 percent. The SKInny: Stratton has a reputation for being the Vail of the East. That’s somewhat true…you will see some of the most expensive get-ups on the liftlines. But you’ll also see straight skis and Tyrolia 480 bindings. It’s big, and can be a pain to wind your way up the hill when the gondie line is long (which is to say, usually). Use the Sun Lodge as your base of operations, and use that side or the Ursa or Snow Bowl lift to make your way to the summit. The skiing is legit — Stratton is a great ski area. Wanderers will enjoy, as will hotshots…but the true hotshot knows there’s tougher stuff out there. Although in recent years Stratton has opened some glades that border on psychotic, so it’s trying to shake the poofy image. Both base lodges at Stratton offer plenty of space to change, and you’re free to leave boot bags piled around. We like that. [Editor’s note – there is some question about this. Best to use cubbies or boot check when available] The food, however, is pretty much dismal anywhere on the hill, so our preference is to head into the Potemkin Village at lunch time; the offerings there aren’t as expensive as you might expect, and the quality is superior to the on-mountain grub. A lot of people grumble about the parking situation at Stratton; seems unless you arrive at the crack of dawn, you’re gonna ride a bus of some sort. The Sun Bowl is a good option if it’s open, but we’ll tell you that all things considered, the Stratton parking and bus operation is pretty smooth and well run. Don’t be turned off by the bus ride. It may be aggravating at first encounter, but it’s really well done. They also move ticket sales along pretty well. Did we mention that all of these perks are reflected in the ticket price? It is what it is, and what it is, is a pretty darn good ski area. The Skiing: Believe it or not, Stratton has some fantastic facilities for beginners and novices. Has experts pretty well covered too, although the true expert terrain is a bit more sparse. The “Villager” area is big and uncrowded, and the emerging novice can soon make their way up the mountain on the South American lift, move to the Tamarack area which is just tremendous for novices…among the best novice areas in the east. Better skiers should work the Ursa Express lift, while the park’n’pipe rats ought to use the American Express chair. The gondola is fast, and the new cabins are infinitely more comfortable than the previous molded plastic bubbles. The great escape is on the old Kidderbrook Trail, a big wide boulevard out in the middle of nowhere. Janeway Junction is the main intermediate route off skier’s left on the summit, and it can get crowded and scraped off. It’s attractive because it takes skiers quickly to the Meadows trails — which are great — however they funnel into something called Drifter Link which can be a brutal mess of bodies, ice, and piles of loose granular. If you want to work the Meadows, do so early. Real early. Signature Trail: Hard to say. Something with a “bear” in the name, most likely. North American kind of covers the Stratton experience pretty well. Perhaps Grizzly Bear. Specs: Summit elevation: 4135 feet; Base elevation: 1485 feet. 17 Lifts: 7 quads, 3 triples, 4 doubles, 4 surface lifts. Uphill capacity: 24,363/hr. Trail Mix: 18-39-43. Longest Run: 15,840′. Season: mid November – March/April. Annual Snowfall: 262 inches. Snowmaking: 68 percent. The SKInny: Sugarbush is a combination of two outstanding ski areas, the original Sugarbush (the one on the left, or south) and the old Glen Ellen, now called Mt. Ellen (north). The two areas remain pretty much separate; moving between the two is a bit of a drag. If you go, plan to stick to one mountain or the other — the connecting lift is a huge time killer. Plans to develop the central area have temporarily been squashed by environmental concerns. Back in the day, Sugarbush was the darling ski area of the east; celebrities and moguls swarmed the moguls (get that?) and it was constantly mentioned in news stories, served as the backdrop for papparazzi photos, ad nauseum. Something happened, however, during the suburbanization of Vermont…Sugarbush was left behind. It’s one of the best destinations Vermont has: Stowe conditions, just an hour north of Killington, with little or no Killington crowd. Forget the darling of the east bit, Sugarbush is arguably the best in the east. Kudos to the racing program and mountain ops also. 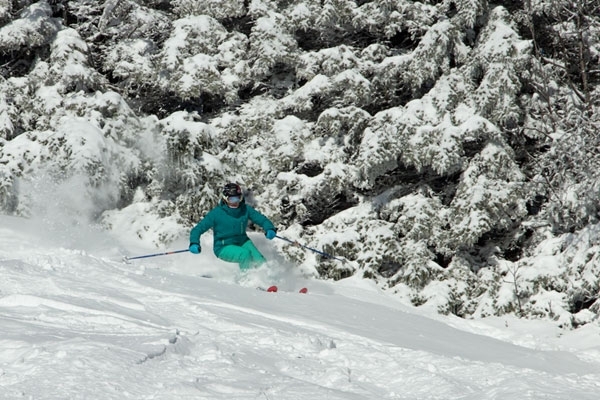 The Skiing: Sugarbush provides the most western-like skiing in the east. No New England ski enthusiast is truly complete until he blasts through the glades on a powder day, or bangs down Stein’s in April. Mt. Ellen provides some truly vicious trails. Wanderers and hotshots will both be content. Signature Trails: Castlerock area and Stein’s at Sugarbush, F.I.S. at Mt. Ellen (formerly Glen Ellen), also Middle glades on the main Sugarbush Mountain. Specs: Summit elevation: feet; Base elevation: feet. Lifts: . Uphill capacity: /hr. Trail Mix: . Longest Run:. Season: mid December – late March. Annual Snowfall: 120 inches. Snowmaking: percent. The SKInny: S6 is a local tow that just sort of grew and grew. Real history here. Mt. Tom was a “beginner” area down the street that some folks still sneak a run down; a marker commemorating the first ski lift in North America is just up the road. This is a quiet area, with a few disquieting drops for experts. It’s unusual that the wide trails give the impression of a ski area that’s wider than it is high. Don’t plan on going “party hearty” at this place. It’s just a good ski area with an awesome slope. Signature Trail: The Face. A true Vermont classic. Williston Ski Associates see Chapman Hill, above. Killington out-opens all but Timberline at Mt. Hood (except for 2002, when an upstart in Connecticut stole the Big K’s thunder). Stowe offers runs with vertical that exceeds much of Colorado. In fact, the American ski area was virtually invented in Vermont; the first rope tow constructed in the Western Hemisphere was just south of Barnard, near today’s Sonnenberg (private) and Suicide Six. Skiing can pretty much be summed up by mini “regions” where ski areas are somewhat clumped together. Starting in the cold, snowy Northeast Kingdom are Jay, Burke, and Lyndon which aren’t exactlygeographically close, but are linked by similar conditions and the fact that they are so far away from every other ski area. Next is the Mt. Mansfield area, which includes the monsters Stowe and Smuggler’s, and by proximity, Bolton Valley and Cochran’s. Just south of Bolton is the Mad River trio of Mad River Glen, Glen Ellen and Sugarbush. The latter two merged a few years ago and are now known simply as Sugarbush. Geographically, Middlebury College Snow Bowl fits in this group. Continuing south, theKillington Megaplex includes the Big K, Pico (which it owns) and Bear Peak (which it doesn’t). We should probably include Okemo, Ascutney and Suicide Six in this group; all are just a short drive away. An alternative is to lump Okemo in the Golden Triangle, which is headlined by Stratton, Bromley and the semi-open Magic. Southernmost is The Valley, which is what the locals call the Dover-Wilmington traffic jam at Mt. Snow and Haystack. Aside from these, a handful of smaller but no less enjoyable tag-a-long areas are scattered about the state; mostly private clubs and local tows. Vermont is indeed a skier’s paradise. Or is it paradox? For all the bazillions of dollars skiing pumps into the state, Vermonters can be pretty disinterested. Vermont boasts more “lost” ski areas than any other state in the union. Long known for their political ineptitude, the state does everything it can to impede, over-legislate, over-regulate, hinder development, and generally make life miserable for the ski industry and related tourism, which coincidentally brings more cash to the state than every other industry combined — including cheese and syrup. On the other hand, a hardscrabble farmer tucked deep in the woods can stitch together a rope tow and operate a 200′ vertical on a holiday weekend with nary a license or inspection, let alone insurance. If you’re really into the history side of Vermont skiing, or perhaps have ties to a particular ski town, there’s a book called Lost Ski Areas of Southern Vermont by Jeremy Davis of NELSAP fame. NELSAP, if you aren’t familiar with it, is the New England Lost Ski Area Program, a loosely organized group started by Davis that preserves the history of shuttered ski areas. NELSAP is affiliated with the New England Ski Museum and all sort of other history folks. Anyway, the book is terrific, the link goes to Amazon.com. A Signature Trail Is mostly subjective. Whether it’s history, reputation, the view, or degree of difficulty…it’s the run you have to do, even if it isn’t necessarily the best the resort has to offer. Finally, a note about ski area statistics: Although it’s hard to believe, some ski areas are (gasp!) less than truthful with their numbers. Like the guy who lies about his, uh, shoe size, some ski areas believe that inflated numbers make their resort sound more appealling. When these numbers are obviously questionable, we put a note: (?!) and will attempt to verify the legitimacy of the claim.